The family of Avicii has set up a foundation in his name to support suicide prevention and mental health. The Swedish DJ - real name Tim Bergling - took his own life in 2018 on tour in Asia. 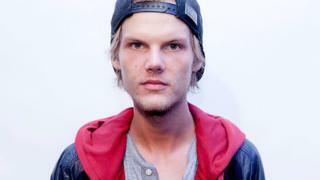 The Tim Bergling Foundation "is our way to honour his memory and continue to act in his spirit," his family says. People working on mental health in the music industry say his legacy has already helped improve awareness in the field. "One of the main issues Avicii's death highlighted was the reluctance of men to talk about the subject of mental health," Tristan Hunt from the Association For Electronic Music tells BBC Radio 1 Newsbeat. He's the co-chair of a group that's working to improve mental and physical health among fans and professionals in the dance music industry. "His suicide brought into sharp relief just how many men suffer from this, especially within our industry. "It's not just electronic music. It cuts right across the industry, it cuts right across our society - but men do find it particularly hard to talk about." Three out of four people who end their own lives in the UK are male, according to a report in September 2018. More recently, Keith Flint from The Prodigy took his life, which his Prodigy bandmate Liam Howlett confirmed as suicide on Instagram. "Avicii's passing and Keith's death over the past year highlight that we clearly have a very long way to go still," says Tristan. "At every level we need to keep talking acting and caring in order to save lives and create lives worth living." One person who knows about how working in the music industry can affect your mental health is Manchester DJ and producer Ben Pearce, who says the anxiety and depression he has faced was brought on by working in music. "I'm glad a foundation is being set up in Tim's name," Ben tells Newsbeat. "It was a really awful tragedy but out of such a dark time, there can be a light. If the foundation helps anybody, I'm sure that will go to redress the balance." Image caption Ben told Newsbeat in 2017 that at his lowest, he was "shaking, throwing up, sweating and generally feeling awful"
Ben says it's "amazing" that anyone is committing time and resources to tackling mental health issues in the music industry. "Just working in such a volatile industry like music, there are a lot of factors that can influence how your day to day life is," he says. "Schedules can change quite drastically and deadlines can change for a lot of people and that puts a lot of additional stress on." Since Avicii's death, Tristan says the music industry has started to address the need for mental health provisions in the same way as it has been in schools and other businesses. "Avicii's death sadly brought that into sharp relief but I think one of his greatest legacies will be that he's helped transform our industry in terms of giving mental health the importance it's always needed," he says. "Now the focus has now been very much upon that to get it resolved." The Tim Bergling Foundation will also work on nature conservation and endangered species - among other issues. Visit the Radio 1 Advice pages for more information on mental health and suicide.